Pioneers in the industry, we offer Solar Water Heaters such as Commercial Solar Water Heaters, Domestic Solar Water Heaters and ETC Solar Water Heaters from India. We are one of the leading manufacturers, traders and suppliers of Solar Water Heaters. The offered solar water heaters are very widely used for heating water in homes and offices. Our manufactured solar water heaters are provided with thermo-siphons, for facilitating quick flow of water through the tubes. The traded solar water heaters are acclaimed for eco-friendly design and high operational efficiency. Our manufactured solar water heaters are low maintenance devices. Our Systems suits the Standards given by MNRE. Packaging Details: Four Layer Corrugated Boxes with Thermacol Inside. Being a reckoned name in the business, we are offering ETC Solar Water Heater to our clients. The offered range of ETC Solar Water Heater is planned with cutting edge working instrument and can be worked helpfully. Utilized for households, Commercial Units & Industrial purposes, these ETC Solar Water Heater have increased wide market acceptance. Capacity of Tanks: 1000LPD, 1250LPD, 1500LPD, 1750LPD, 2000LPD, 2250LPD, 2500LPD, 3000LPD, etc. Volume of One Unit will be More than 3000LPD & above any capacity we can work. Warranty we give 5 years to 10 years. Packaging Details: Packed in four Layer Carton Box with inner line of Thermacol. 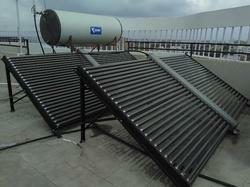 We are engaged in offering wide range of Commercial Solar Water Heaters. These items are easy to install but difficult to introduce and uses sunlight based vitality to charge. 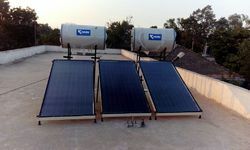 Our Commercial Solar Water Heaters are utilized as a part of business applications and provides hot water. Additionally, these items are known for their long operational life and fast response. Keeping in mind the changing necessities of our clients, we are offering best nature of Domestic Solar Water Heaters. Domestic Solar Water Heaters utilizes solar energy to heat water and exceptionally requested for their viability. We have extensive variety of items in business sector and one can buy these items at sensible rates. Looking for Solar Water Heaters ?